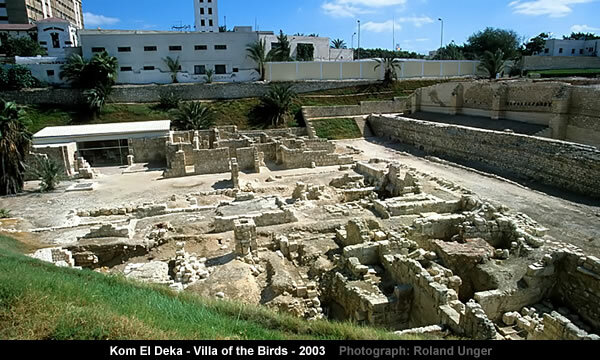 The party line promoted by Wikipedia is that Kom El Deka was the Roman Quarter of Alexandria between the 4th and 7th centuries. 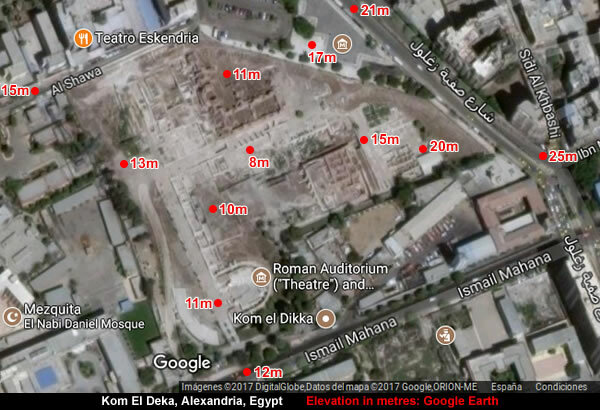 Recent archaeology at Kom El Deka (heap of rubble or ballast) has found the Roman quarter of Alexandria beneath a layer of graves from the Muslim era. 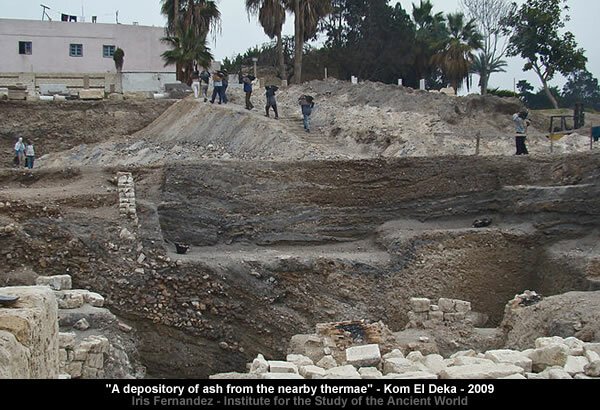 The remains found at this site, which are dated circa the fourth to seventh centuries AD, include workshops, storefronts, houses, a theater, a public bath, and lecture halls, as well as Coptic frescoes. 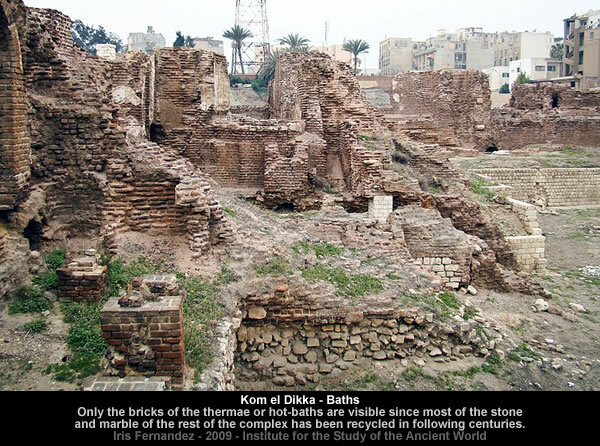 The baths and theater were built in the fourth century and the smaller buildings constructed around them, suggesting a sort of urban renewal occurring in the wake of Diocletian. Apparently, they prefer to draw a veil over the early 1st century AD Roman villas. The explored part of an Early Roman house (H) covers an area of some 400 sq.m. which is more than half the estimated size of the structure. Well preserved superimposed remains of late Roman structures have made it difficult to explore in full and interpret all the identified rooms. However, even at the present stage of investigations some conclusions of a more general nature concerning the plan of the house and its functional arrrangement can be put forward. Constructed in the early 1st century A.D., House H consists of two clearly distinguished units, contained within the frame, a single architectural complex. 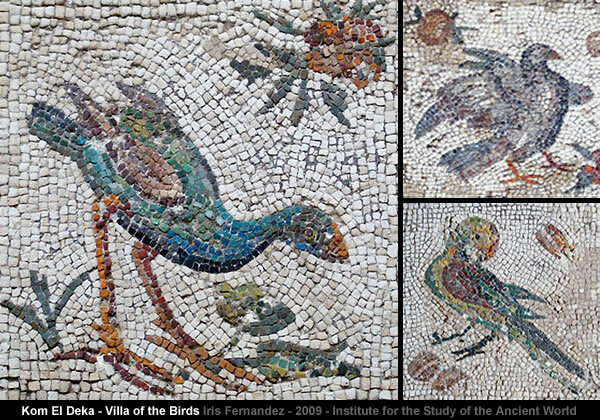 This is unfortunate as the Villa of the Birds has a beautiful Early Roman mosaic. This fascinating book describes the excavation and preservation of three early Roman villas in Egypt’s ancient port city of Alexandria. 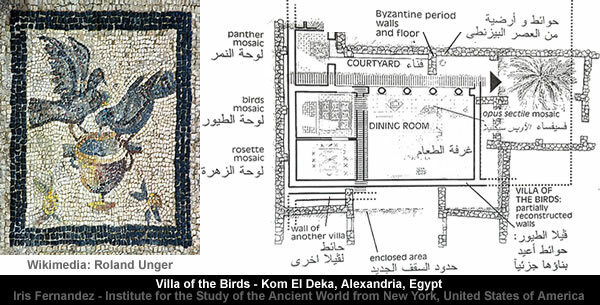 Chronicling the work of the Polish Archaeological Mission in Alexandria, Villa of the Birds is an engaging and informative account of how these ancient dwellings were unearthed, and how the famous mosaic floors were brought to light two thousand years after they were laid. With the expert guidance of the archaeologists responsible for the excavation, the reader is led through layers of clues reaching ten meters below today’s street level, and to an in-depth appreciation of this extraordinary site’s rich history. Drawing directly on their work with the Polish Archeological Mission, the authors describe in detail the excavation of the housing areas, as well as the baths, the gymnasia, and the theater that comprise the villa complex. 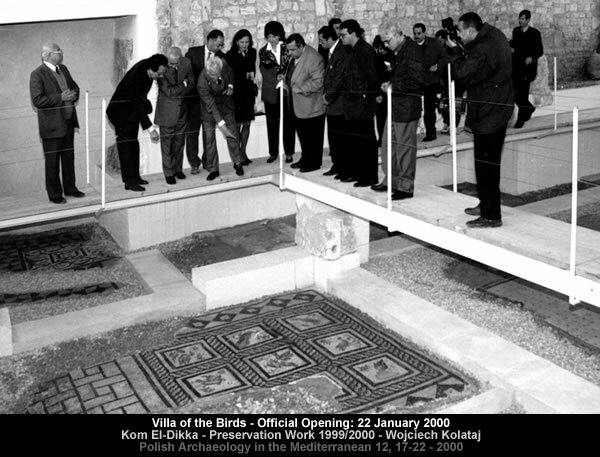 Villa of the Birds reconstructs not only the villas themselves, with their magnificent mosaics, but also the history of how they were built and used, and ultimately how they were destroyed by fire. They also prefer to draw a veil over the 2nd/3rd century Greek inscription in the Roman Baths. A huge block of nummulithic limestone was found in the vaulted substruction of the Roman baths… One of the surfaces of the block has a Greek inscription which apparently belongs to the period when the block was used for the first time. The writing points to the later IInd or IIIrd century A.D. This is probably because they prefer to draw a veil over the “thick stratum of debris” that separates the Early from the Late Roman occupation periods. 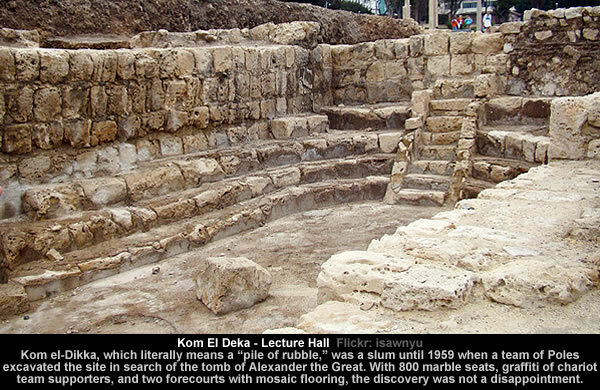 The complex was abandoned and deliberately dismantled not before the end of the 3rd century A.D.
All reusable building material must have been removed, since no associated destruction level was found. The Late Roman occupation phase is separated from earlier levels by a thick stratum of debris containing numerous fragments of coloured plastering (painted red and black), mosaics and some pieces of architectural decoration, of which a semicircular finely cut cornice is the best example. Well preserved ruins of mainly 1st-3rd century A.D. villas were discovered in trenches all over the site. In the late 3rd century the entire area suffered extensive and serious damages, which are commonly attributed to a series of historical events : the Palmyrenian invasion, Aurelian’s siege and Diocletian’s repressions. The Late Roman occupation level was separated from earlier layers by a thick (c . 1.00-1.60 m) leveling stratum containing heavy concentration of architectural debris: mortar chunks, fragments of plastering, and stone rubble. Or it may be because they prefer to draw a veil over the lack of “private architecture” in the Late Roman period. In the early Roman period the site was occupied by large urban houses, resplendent with fine mosaic floors. 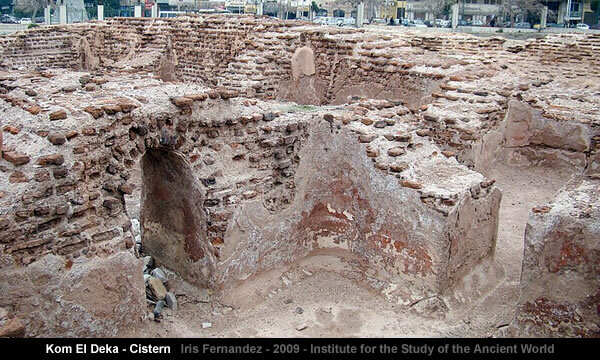 Yet this private architecture was destroyed in the end of the 3rd century and was never rebuilt. Or it may be because they prefer to draw a veil over why the site is said to have been redeveloped in 5th/6th centuries with over twenty auditoria [aka lecture halls]. Lining the monumental portico was a series of auditoria, obviously of special significance considering the location in public space in the very heart of the ancient town. 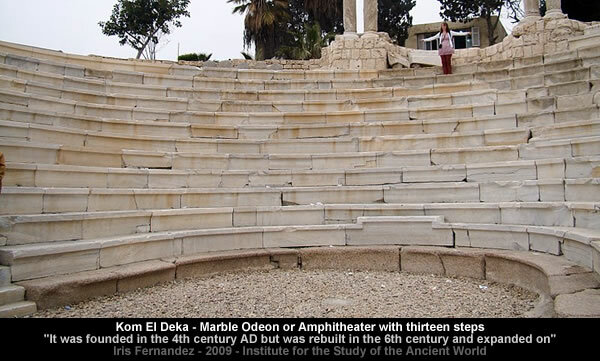 The entire zone of public buildings, including the odeum and the baths, must have thus been considered the civic center of Late Antique Alexandria, replacing in this function the Ptolemaic and early Roman agora and gymnasium , both of which must have been in ruins by this time. Overall, the available material points to the late 5th – first half of the 6th century AD as the most plausible time for the construction of the whole complex. More importantly, the rebuilding of the theatre and the bath complex falls in the same period. The lecture halls, or at least some of them, appear to have survived all the political tribulations of the first half of the 7th century (first the Persian and later the Arab invasion) and continued in use for quite some time, possibly even till the end of the century. Or it may be because Kom El Deka raises more questions than it answers. But, like any new, unexpected discovery, also this one raises more questions than the answers it provides. Is the complex of lecture halls evidence of organized education? What was the reason for this sudden development of academic life in Alexandria in this period? Why do the Late ruins appear to be lower down in the debris than the Early villa ruins? 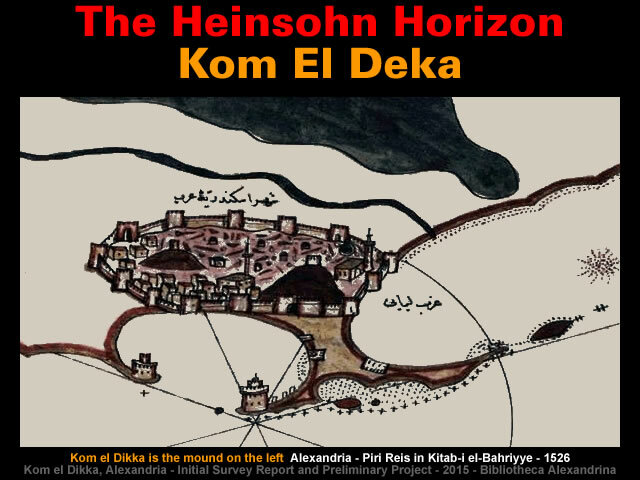 Gallery | This entry was posted in Arabian Horizon, Catastrophism, Comets, Enigmatic Egypt, Epigraphy - Inscriptions, Heinsohn Horizon, History, Old Japanese Cedar Tree. Bookmark the permalink.